Making false claims, misusing government machinery for propaganda, and managing events and headlines are the hallmarks of the Modi style of governance. 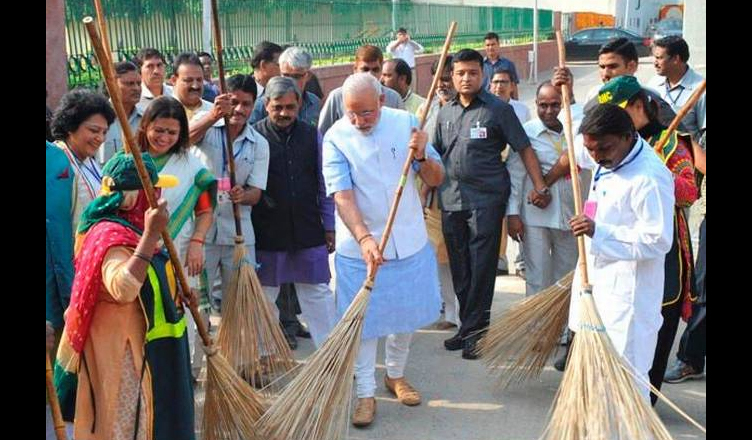 Every year on October 2nd and at every possible opportunity, ministers and BJP leaders line up for photo-ops with brooms in their hands and make grandiose claims about ‘Swachh Bharat’. On August 15, 2014, the Prime Minister announced that he would ensure India does “not leave a speck of dirt in our village, city, street, area, school, temple, hospital… when we celebrate the 150th anniversary of Mahatma Gandhi” on October 2, 2019. Today, PM Modi is nowhere close to achieving his promise. PM Modi adopted a successful UPA programme, Nirmal Bharat Abhiyan, renamed and rebranded it, and then launched it with much fanfare in 2014, as Swachh Bharat Mission (SBM). The failed implementation of the Mission and the fake propaganda surrounding it are truly representative of the hollowness of Modi government’s flagship programmes. The focus of Swachh Bharat Abhiyan has been the celebration of missed targets, neglected issues, and repeated lies. ‘Swachh Bharat’ is a success only on hoardings and advertisements. There are lies, damned lies, and then ‘Swachh Bharat’ statistics. The CAG and the Parliament attest to this. The Modi government’s overriding desire to show a rapid pace of toilet construction has distracted from the objective of better health outcomes in a planned and sustainable manner. Toilets are being built indiscriminately, despite them not being used due to a lack of other supporting amenities. A CAG report stated that “household water connections were not available and, therefore, toilets constructed under SBM could not be used”. The Lok Sabha Standing Committee on Rural Development candidly observed in July 2018 that the government’s “sanitation coverage figures seemed to be more on “paper” but the actual progress at the ground level is very lethargic… building of toilets alone is not sufficient for the realization of actual vision of an Open Defecation Free (ODF) country”. Through its blinkered approach of only constructing toilets, Modi government neglected carrying out Information, Education and Communication activities at the grassroots, which are crucial for bringing about the behavioural change to popularise use of toilets. Instead more than Rs 530 crore was spent on print, radio and television advertisements, till 2017, according to the government’s response to an RTI enquiry . The utter failure in providing cleanliness forced the World Bank to call implementation of SBM “moderately unsatisfactory”. The Bank subsequently withheld installment due towards the programme. There cannot be a Swachh Bharat without its citizens’ access to clean drinking water. The excessive focus on publicity and building toilets has meant the neglect of provisions for clean drinking water. Allocations for drinking water have been slashed since Modi government took office. The government’s ‘Swachh Sarvekshan’ certified Bhopal as the second cleanest city in India two years in a row. However, an independent survey found more bacteria in Bhopal’s drinking water than commonly present in human urine . The level of coliform bacteria and total dissolved solids found in Bhopal’s drinking water is 2,400 times above the permissible limit. Union government informed the Lok Sabha in February that Gujarat had been declared Open Defecation Free (ODF) in 2017. Now it has emerged that claims of Gujarat being ODF are plain lies. The CAG in its performance audit observed, “information provided by 120 test-checked GPs under eight selected DPs for the period 2014-17 revealed that 29 per cent HHs still did not have any access to toilets (either individual or public)”. A Praxis-Institute of Development Studies-WaterAid study found that only one out of eight ODF verified villages in three states (Madhya Pradesh, Rajasthan and Uttar Pradesh) was ODF. A survey by the Centre for Policy Research found that only 1 out of 8 verified ODF gram panchayats in Udaipur was actually ODF. BJP government has spent all its energies to announce Uttar Pradesh is declared ODF by October 2, 2018. To achieve this target, officials have gone to the extent of fudging numbers. The pressure to achieve unrealistic targets that are counter-productive comes from none other than the Prime Minister. A 2016 report by Youth for Unity and Voluntary Action (YUVA) on forced evictions noted that 727 families in Indore were evicted from their homes prior to the ‘Swachh Sarvekshan’ carried out by the government. Families that had paid money to Indore Municipal Corporation for the construction of toilets found themselves evicted and their homes demolished. The pressure on administrators to declare villages as ODF led to the demolition of slums without toilets with no regard to the human cost. In Swachh Bharat, it seems that citizens are being cleaned out. In the 2015 national executive of the BJP, an end to manual scavenging was announced as their next mission. As every other announcement and commitment by the Prime Minister and BJP, this too was absolutely insincere. Since 2017, there has been one manual scavenging death every five days. This is a human shame and a criminal offence. In 2017, official records accounted for 13,000 workers engaged in manual scavenging. In 2018, “an inter-ministerial task force has counted up to 53,236 people involved in manual scavenging”. Other independent estimates indicate that as many as 5 million people are engaged in some form of manual scavenging work. This is despite UPA bringing in legislation to prohibit manual scavenging in 2013. The horror of manual scavenging and caste discrimination is a reality in PM Modi’s Swachh Bharat. As indicated by the Standing Committee on Rural Development in its 2017-18 Report on the Ministry of Drinking water and sanitation, the budgetary allocation to SBM has been short of the requirement. As against a demand of INR 14,000 crore in 2016-17, only INR 9,000 crore was allocated in the budget, further revised to just INR 10,500 crore. Further, there are large unspent balances to the tune of INR 9,890 crore with the states as of May 2018. Because the programme is designed in a way that gives underperforming states less funding the following year, large unspent balances are building up. And this shows no sign of change since little is being done to strengthen the ability of states to implement the programme at the grassroots. In its rush to show dramatic progress on Swachh Bharat Mission and to somehow malign the achievements of previous governments, the Modi government is blatantly deceiving the people of India. Villages, gram panchayats and districts are being declared ODF to meet the 2 October 2019 deadline even when they clearly do not qualify. Government-sponsored studies are showing a “reality” that is at variance with independent studies, including the CAG. The desire to show progress at any cost is resulting in a rush to build toilets without considering its effectiveness or how it is damaging other goals, such as the provision of safe drinking water to the citizens. It is has come to such a level that no independent agency can trust the government’s official numbers on ODF anymore. This is in direct contrast with how the UPA implemented its flagship programme, the MGNREGA. Social audits, independent studies and research were actively encouraged. The Modi government is doing everything it can to suppress the truth of Swachh Bharat Abhiyan. Like so much else under the Modi government, the Swachh Bharat Abhiyan involves manipulated data to show progress, false claims and outright lies. Neither PM Modi’s niyat nor our country will be saaf anytime soon. The truth is Swachh Bharat Abhiyan is completely hollow.